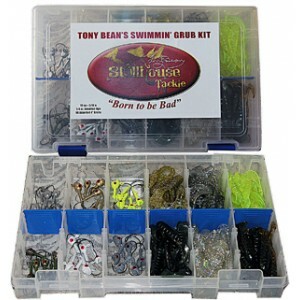 This kit is filled with Tony’s specially designed grubs and leadheads — it’s everything you need to catch those big ol’ smallmouths! Swim your grubs like a minnow or crawl it on the bottom like a crawfish and get that smallie’s attention right now! • 3 Unpainted Leadheads in 2 sizes – 3/16 and 1/4 oz. • 3 Gold Leadheads in 2 sizes – 3/16 and 1/4 oz. • 3 Chartreuse Leadheads in 2 sizes – 3/16 and 1/4 oz. • 3 Pearl Leadheads in 2 sizes – 3/16 and 1/4 oz. • 3 Gray Leadheads in 2 sizes – 3/16 and 1/4 oz. • 3 Green Leadheads in 2 sizes – 3/16 and 1/4 oz.